Linux users are a discerning bunch. Part of the reason they choose this operating system is because they like things just so. Open source software allows them to tweak things to achieve that. It follows that they might be the same way in other areas of their lives, which means they’re probably difficult to buy gifts for. With the holidays coming up, you may be a little nervous deciding what to get for the Linux lover in your life. 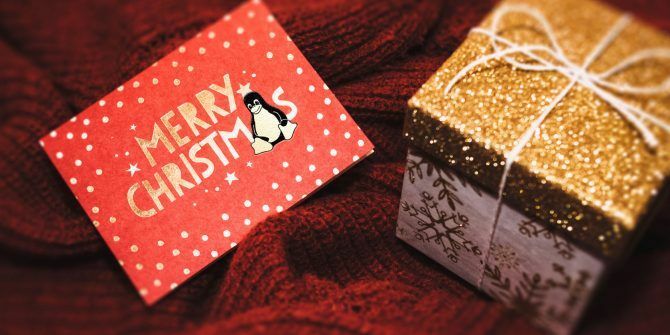 Below we’ve gathered some Linux gifts ideas for any budget. Because if there’s one thing Linuxers love, its when someone new joins the team. We’ve got ideas for every budget below to delight the Linux fan on your gift list. We’ll look at these in four main budget categories: Stocking Stuffers, then Small, Medium, and Large Gifts. What to get? Stickers, Mugs, Pins, etc. A great way to kick off holiday mornings is with the little things that let your giftee proclaim his or her love of Linux. It’s common to find stickers of the various Linux flavors (distributions What's The Difference Between Linux Distributions If They're All Linux? [MakeUseOf Explains] What's The Difference Between Linux Distributions If They're All Linux? 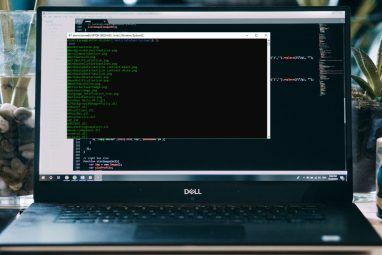 [MakeUseOf Explains] When a user is first introduced to Linux, they might be told they're using Linux, but they'll quickly learn that it's called something else. Yes, Ubuntu, Fedora, Linux Mint, Debian, openSUSE, and so many others... Read More ) on the lids of laptops. (Especially when they cover up the big, glowing logos of non-open companies.) Unixstickers.com is where you should start, as they specialize in items related to open source operating systems and programs. You can find stickers representing just about everything in the world of open source. From the OS itself (such as Debian, shown in the below image, top left) and FreeBSD Linux vs. BSD: Which Should You Use? Linux vs. BSD: Which Should You Use? Both are based on Unix, but that's where the similarities end. Here's everything you need to know about the differences between Linux and BSD. Read More (top center), to applications like Emacs (top right) or VLC 6 Awesome VLC Features You May Not Know About 6 Awesome VLC Features You May Not Know About There's a reason VLC is called the Swiss Army Knife of media players. This article identifies six awesome VLC features and explains how to use them. Read More (bottom left), many choices are there. Even niche projects like programming languages (Ruby, bottom center) and CMSes Everything You Need to Know About Content Management Systems Everything You Need to Know About Content Management Systems For the average internet surfer, viewing content is easy. You open a link, and the page appears. But what is taking place behind the scenes? Here's how your favorite CMSs take care of business. Read More (Drupal, bottom right) are available. The site Zazzle.com has similiar small items like travel mugs or an excellent Linux directory What Are Those Folders in Your Linux Root Directory? What Are Those Folders in Your Linux Root Directory? Open a file manager on your Linux box and select Computer in the sidebar to display your system folders. But do you have any idea what each of them hold? Let's take a look! Read More hierarchy mouse pad (shown below). In addition to laptop lids and desk surfaces, your giftee’s person is another place he or she can show support. Specifically, by hanging branded clothing on it. Two of the sites above, Zazzle and Redbubble, have a wide selection of t-shirts. For example, the below image shows shirts from Zazzle for those who love classic Tux (below left), like to live dangerously with the sudo command What Is SU & Why Is It Important to Using Linux Effectively? What Is SU & Why Is It Important to Using Linux Effectively? The Linux SU or root user account is a powerful tool that can be helpful when used correctly or devastating if used recklessly. Let's look at why you should be responsible when using SU. Read More (below center), and frequent one of the original open source news sites The SourceForge Controversy, and the Ongoing Fall of Slashdot Media, Explained The SourceForge Controversy, and the Ongoing Fall of Slashdot Media, Explained Over the past few days, one of the world's premier download portals has been in the middle of a controversy – and one of the web's first geek communities is being dragged down with it. Read More (Slashdot, below right). Now that the weather’s getting colder there’s also heavier wear, such as Redbubble’s Docker How to Safely Test Desktop Applications in a Secure Container With Docker How to Safely Test Desktop Applications in a Secure Container With Docker Docker is a popular platform for developing and testing server-based applications. But did you know you can also use it to safely and secure run new programs on your desktop? Read More sweatshirt (below left), Raspberry Pi hoodie (below center), and PHP zippy (below right). Firstly, you could check to see if the app is compatible with Wine, a software package that helps Linux run Windows programs. Codeweavers’ Crossover for Linux is a paid version of the Wine software that’s particularly easy to install and use. It also boasts a large selection of compatible Windows titles. So check to see if the app(s) your recipient wants are compatible, then pick them up a Crossover license (which is also in this price range, $59.95 for one year of supports and updates). There is also a free program similar to Crossover called PlayOnLinux. You can simply gift them the Windows app, at which point they can install it themselves How to Install and Use Microsoft Office on Linux How to Install and Use Microsoft Office on Linux Linux is great, but how on earth can you install Microsoft Office without running into problems? Here's what you need to do. Read More with PlayOnLinux. Supported programs (like Microsoft Office 2010 or The Elder Scrolls V: Skyrim) should install via point and click. Others may not be as simple, but can still work with some manual tweaking. Alternately, you could set them up with a copy of Windows to install on a virtual machine. This is a layer of software that essentially looks like another computer inside your computer. Your recipient can install Windows on this virtual computer, and then any software that is compatible with Windows. On the other hand, software’s compatibility with Linux has improved quite a bit in the last couple years, especially in one area that fits this price category: games! If your giftee is a game fanatic, there are two great sources for games that run on Linux, no software wizardry required. The first is Steam, and if your recipient is a gamer he or she is probably on Steam already. You can check the list of games here that play natively on Linux (we outlined a number of them last year in this article 10+ Windows Games You Could Be Playing on Linux with Steam 10+ Windows Games You Could Be Playing on Linux with Steam If you've been holding onto Windows simply to play your favorite games, let go. Installing SteamOS is now a viable option and the following collection of titles illustrate just what the situation is in 2016. Read More ). Now, the selection is tilted a bit towards indie and small publisher games when compared to Windows. But there are top titles available, such as Rocket League 9 Windows and Console Games Now Available on Linux 9 Windows and Console Games Now Available on Linux "The Year of the Linux Desktop" yet to arrive, but until it does, you can play these popular PC and console games natively on your Linux OS -- no emulation or virtualization required! Read More , the latest installment of Civilization, and entries in the Borderlands series. Once you have the game in your sights, getting it to your giftee is as easy as purchasing a Steam gift card. While Steam is the proverbial 800-pound gorilla in game distribution, Linux users revel on choice. Another game store Where to Download the Best Linux Games Without Any Hassle Where to Download the Best Linux Games Without Any Hassle Not even a decade ago, native gaming on Linux was limited to open source, cross-platform games. Today, the "no games on Linux" myth is dead. But where do you find compatible games? Read More catering to the Linux crowd is GoG.com, which boasts titles that are free of digital rights management (DRM) What Is DRM & Why Does It Exist If It's So Evil? [MakeUseOf Explains] What Is DRM & Why Does It Exist If It's So Evil? [MakeUseOf Explains] Digital Rights Management is the latest evolution of copy protection. It’s the biggest cause of user frustration today, but is it justified? Is DRM a necessary evil in this digital age, or is the model... Read More . Like Steam, it also supports Windows games, and the selection of Linux games is smaller and trends towards smaller publishers. But GoG does carry popular titles, most notably Witcher 2, Baldur’s Gate (the Enhanced versions of the original as well as the sequel), and Shovel Knight. Buying these games for your giftee takes a few more steps, as GoG doesn’t currently offer gift cards. They do, however, allow you to select “Gift this order,” which lets you load up your cart and bestow it upon your Linux supporter. It does require that you both have GoG accounts, so this is an excellent present if you’re both avid gamers already on the service. Best of all, both the RPi as well as many of its accessories are within this price range. You can get a full starter kit including the Pi itself, a case, a power cord, heat sinks, and a 32 GB storage card for just $69.99. Other add-ons such as touch displays or camera modules can be had within this budget from vendors like Amazon or Adafruit. After they open it, consider directing your giftee to our Unofficial Tutorial on the RPi Raspberry Pi: The Unofficial Tutorial Raspberry Pi: The Unofficial Tutorial Whether you're a current Pi owner who wants to learn more or a potential owner of this credit-card size device, this isn't a guide you want to miss. Read More as a starting point for their hardware hacking. When it comes to Big Gifts, you’re probably looking at a pretty big jump in budget. Other ecosystems have some moderately-priced devices, including things like Android tablets The Best Android Tablet Yet? Samsung Galaxy Tab S3 Review and Giveaway The Best Android Tablet Yet? Samsung Galaxy Tab S3 Review and Giveaway Taking aim at the iPad Pro, the Samsung Galaxy Tab S3 is the same weight, height, and price, but comes with a free stylus. It's the best Android tablet yet. Read More and (some) iPads Which iPad Should You Buy? Air, Pro 9.7" and 12.9" Compared Which iPad Should You Buy? Air, Pro 9.7" and 12.9" Compared You now have four separate iPads to choose from, including the regular iPad Air, the iPad mini, and two sizes of iPad Pro. Here's how to choose between them. Read More . But for a full-on Linux gift, you’re talking about getting your recipient one of the systems with Linux pre-installed. 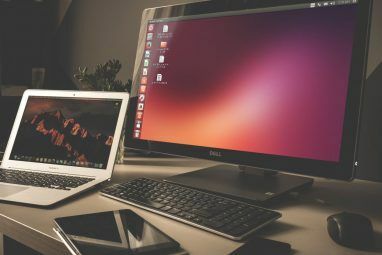 There are desktop systems available that go as low as $99 The 5 Best Cheap Linux Computers to Buy Today The 5 Best Cheap Linux Computers to Buy Today Here are several cheap Linux computers you can get that come pre-installed with user-friendly operating systems. Read More . These less expensive machines have weaker processors, less RAM, and less storage. This is OK though, as Linux arguably runs better on fewer resources Does Linux Use Less RAM Than Windows? Does Linux Use Less RAM Than Windows? It depends. Windows and Linux may not use RAM in exactly the same way, but they are ultimately doing the same thing. So which one uses less RAM? Read More than Windows. The lower-end systems are likely to be the “mini-PC” form factor (shown below at left) that’s compact, but limits expansion. More expensive systems can run $1,000 or more, but these are generally beasts intended as workstations (an example is shown below at right). In other words, your giftee will love them. As far as distribution choice, you can configure Dell’s recently-releasted Precision 5720 system with either Red Hat or Ubuntu. Two smaller manufacturers also offer desktop systems: System76 pre-installs a home-spun OS called Pop!_OS (which we recently examined Pop!_OS Has Arrived: How Does It Compare to Ubuntu? Pop!_OS Has Arrived: How Does It Compare to Ubuntu? System76's Pop!_OS Linux operating system is available for download, and is also shipping as the default option on new computers from System76. Should you check it out? Read More ), while ZaReason will install your giftee’s choice of Linux flavor when you order. If you’ve got the money to spend, you can also consider Linux laptops. All three of the companies above (in addition to some others Pop!_OS Has Arrived: How Does It Compare to Ubuntu? Pop!_OS Has Arrived: How Does It Compare to Ubuntu? System76's Pop!_OS Linux operating system is available for download, and is also shipping as the default option on new computers from System76. Should you check it out? Read More ) offer laptop models ranging from big, chunky developer machines (like ZaReason’s Verix 7220, shown below at right) to svelte ultrabooks. And they all come with Linux pre-installed. We’ve looked at one of the offerings from System76 in the past (an older model, but the conclusion was very positive System76 Gazelle Professional Laptop Review & Giveaway System76 Gazelle Professional Laptop Review & Giveaway As an avid user of Linux, I’ve been very interested in laptops specifically built to operate Linux, as my own laptop had a few minor issues that were never resolved. This high interest led us... Read More ), and this author is very happy with Dell’s XPS 13 Developer Edition laptop (shown below at left). Now, there is a very budget-conscious Linux laptop that MUO reviewed recently. We found the Pinebook to be something that definitely comes with some compromises Pinebook 64 Review: $100 Laptop That Isn't Terrible Pinebook 64 Review: $100 Laptop That Isn't Terrible It's a $100 laptop that runs Linux – it obviously isn't going to replace your MacBook. But it's not actually as bad as we thought it might be. Read More . But at a price tag of just under $100, it’s an option for a mobile companion device that runs honest-to-goodness Linux. If these systems aren’t quite what you can do budget-wise, a Chromebook or Chromebox is a great compromise. 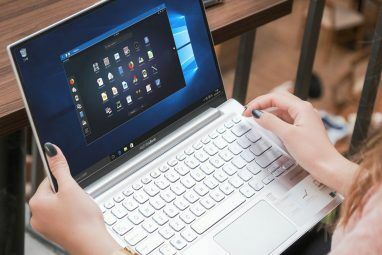 Google’s Chrome OS is Linux at its heart, and it eschews many of the proprietary systems and applications that many Linux lovers dislike. Even more “premium” devices of the bunch such as Asus Aaluminum Flip C101 or Acer Chromebook 14 are reasonably priced. Depending on retailer, you can pick them up for around $300 and $260, respectively. Chromeboxes are the desktop equivalents, although to be frank they don’t offer that much of a price savings from most Chromebooks, so why not get the portability? Best of all, there is a clever bit of software How to Install Linux on a Chromebook How to Install Linux on a Chromebook Do you need Skype on your Chromebook? Do you miss not having access to games through Steam? Are you pining to use VLC Media Player? Then start using Linux on your Chromebook. Read More called Crouton that allows users to install real Linux right alongside Chrome OS. So in that regard these might be the Linux laptops that give the best bang for the buck. We hope this list will provide you some ideas for the Linux fan on your Christmas list. Armed with the knowledge of what OS or applications your giftee likes, you can go to many of the above outlets and pick up smaller items immediately. Some of the larger-ticket items may require subtle probing about your recipient’s likes and dislikes. But with a bit of detective work you can pick out the perfect option for that big gift under the tree. Do you have any die-hard Linux fans in your life? Have you ever managed to buy them a Linux-related gift they absolutely loved? Give us your stories, tips, and ideas in the comments below! Explore more about: Gift Guide, Linux. You should mention books, as they prove to be invaluable at trending into Linux. Yes, books are a good one too. Especially the ones from O'Reilly and A press. Thanks for the idea!